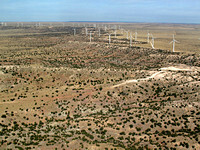 New Mexico has a total of 698 megawatts of wind power capacity installed at seven wind power plants. 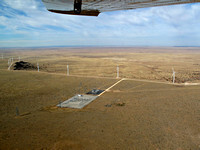 The first utility-scale wind power plant in New Mexico, near House, commenced operation in July 2003. 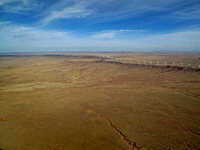 Known as the New Mexico Wind Energy Center, it is 204 megawatts in capacity. All of its generated electricity is purchased by PNM. 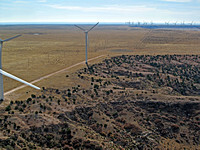 Energy produced at the New Mexico Wind Energy Center will replace an equivalent amount of power coming from facilities powered by coal and gas. Wind now comprises eight percent of PNM's overall generation capacity. However, because of the intermittent nature of wind, the facility's output is expected to comprise about four percent of the energy actually produced by or for PNM over the course of a given year. EcoFlight teamed up with the Institutes for Journalism & Natural Resources, based in Missoula, Montana, to be part of a week-long learning expedition fellowship for 25 journalists from around the country. 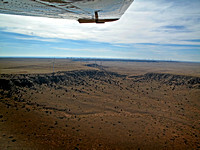 On these flights and many more, we flew over the Aragonne Mesa Wind Farm at the eastern end of New Mexico near Santa Rosa. This wind farm is owned by the Pinnacle West Capitol Corporation. The potential for electricity generation from wind is enormous in New Mexico, especially on the eastern plains, with annual wind energy potential estimated to be 435 billion kWh. 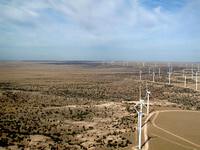 When the Aragonne Mesa Wind Farm came online in 2006 it marked the largest single source of energy from a renewable project in the company's history. The plant increased the company’s renewable energy portfolio from 16 megawatts to 106 megawatts—a 563 percent increase. 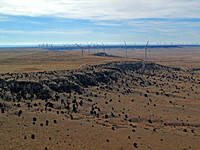 The 15-square-mile wind farm took 18 months to build and contains 90, one megawatt Mitsubishi New Wind Turbines. Each 227 ft. turbine has three 63 ft. blades and a one-acre footprint, the majority of which are aligned along a northeast to southwest axis. Estimated annual energy production is 225 kWh's. Electricity produced by the 90-megawatt wind farm serves over 23,000 homes in Arizona, through a purchase power agreement by the owners of the wind farm and APS, the public service utility company in Arizona. More than 35 miles of overhead transmission lines connect the facility to the interconnect substation.